The past five days in the Adirondacks have been simply gorgeous. While the beautiful weather is appreciated by most everyone lucky enough to be here, it has been especially sweet for us die-hard skiers. I've managed to ski myself to sweet exhaustion out the back door at Mount Van Hoevenberg and in the backcountry. 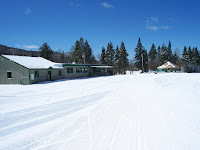 The weather looks good for us skiers for the next week or so, so you might want to get up here for some spring turns!